2. The New Brick or the New, New Brick Church detailed below. ​The New Brick bell of Boston. This was Paul Revere's general place of worship in the North End. It probably should be called the New/New Brick Church. Some of the congregation splintered off. Unfortunately, both churches were consumed by fire and not restored. Elbridge H. Goss, Some may find him too adoring. We believe Goss would elevate Paul Revere to a "Founding Father," Though Revere was not of the White Whig Esquire Society of Boston, his contributions to this nation equal any other signer of the Declaration of Independence and far exceeds the contributions of many that approved the Constitution. 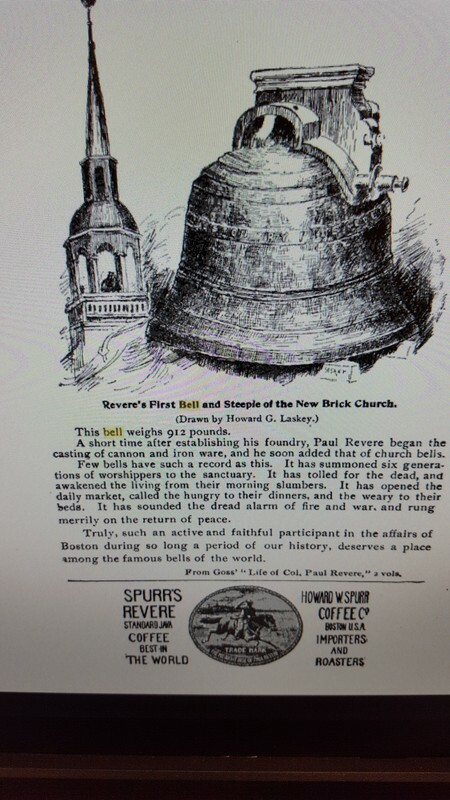 More than likely this bell tolled for Paul Revere on the day he died. Bells in Boston took turns announcing the passing of its citizens by the sequence and number of strikes.